In 1996, Supreme Court nominee Elena Kagan wrote a White House memo in which she said that she had just discovered that the American Congress of Obstetricians and Gynecologsts (ACOG) was about to issue a statement saying that the organization was unable to think of any case in which partial birth abortion was the only way to save the live of the mother. Kagan's memo said this statement "would be a disaster", presumably because it would undermine the pro-abortion position justifying partial birth abortion. 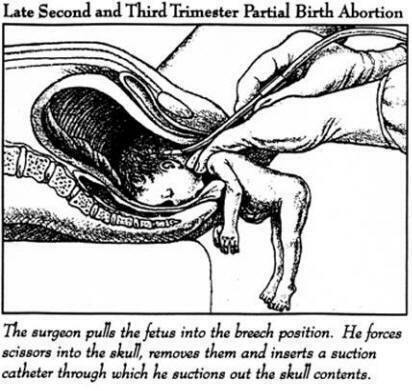 ("Partial-birth abortion" the horrific procedure in which a baby is partially delivered before a sharp object is inserted into the baby's skull to scramble his or her brains). Kagan apparently intervened and had the statement changed. The revised language was used verbatim in an argument supporting partial birth abortion before the Supreme Court in which the Court overturned a state ban on the barbaric practice. The woman responsible for this abomination is about to become the next Supreme Court justice. Back during the Presidential campaign some preachers who were desperately trying to be "relevant" argued that we should not be "one-issue" voters and should not let abortion keep us from voting for Obama (I think Rick Warren was one of these preachers but I could be wrong). Thanks to those preachers and their influence on their congregations, Elena Kagan will be Obama's second appointee to the Supreme Court. If McCain had been elected, two pro-life justices would have been appointed to the Court and there is a good chance that Row v. Wade could have sent abortion decisions back to the states. Instead, millions more babies will die--thanks in no small part to pastors who were more concerned with being relevant than biblical and who encouraged their congregations not to be "one issue voters"--not even if that issue was the slaughter of little babies! To those pastors: Please, please don't make this tragic mistake in the next election!!! While I agree with your position, it is clear to me that Justice David H. Souter (replace by Sotomayor) was waiting to retire until another liberal was President so that his replacement would share his progressive ideology. Likely the same with Justice John Paul Stevens retiring now. However, I think McCain would have appointed liberals also, just to "play nice" with the left. I am no fan of McCain but my understanding was that he was committed to appointing pro-life justices.